Interactions between proinflammatory and cell maturation signals, and the pathways that regulate leukocyte migration, are of fundamental importance in controlling trafficking and recruitment of leukocytes during the processes of innate and adaptive immunity. We have investigated the molecular mechanisms by which selective Toll-like receptor (TLR)2 and TLR4 agonists regulate expression of CCR1 and CCR2 on primary human monocytes and THP-1 cells, a human monocytic cell line. We found that activation of either TLR2 (by Pam3CysSerLys4) or TLR4 (by purified LPS) resulted in down-modulation of both CCR1 and CCR2. Further investigation of TLR-induced down-modulation of CCR1 revealed differences in the signaling pathways activated, and chemokines generated, via the two TLR agonists. TLR2 activation caused slower induction of the NF-κB and mitogen-activated protein kinase signaling pathways and yet a much enhanced and prolonged macrophage-inflammatory protein 1α (CC chemokine ligand 3) protein production, when compared with TLR4 stimulation. Enhanced macrophage-inflammatory protein 1α production may contribute to the prolonged down-regulation of CCR1 cell surface expression observed in response to the TLR2 agonist, as preventing chemokine generation with the protein synthesis inhibitor cycloheximide, or CCR1 signaling with the receptor antagonist UCB35625, abolished TLR2- and TLR4-induced CCR1 down-modulation. This result suggests an autocrine pathway, whereby TLR activation can induce chemokine production, which then leads to homologous down-regulation of the cognate receptors. This work provides further insights into the mechanisms that regulate leukocyte recruitment and trafficking during TLR-induced inflammatory responses. Trafficking of leukocytes from blood into tissue occurs constitutively and is enhanced during inflammation. The regulation of these processes offers fundamental targets for the treatment of many human diseases. These processes are heavily dependent upon chemokines and their receptors. Monocytes and cells derived from them, such as macrophages and dendritic cells (DCs),3 are critical to the innate immune system and provide important bridges into adaptive immunity through both the regulated generation of proinflammatory cytokines and their ability to present Ag. Disease-specific variations in inflammatory infiltrates have been reported. For example in arthritides, infiltrates contain mainly cells of the monocyte lineage (1) that produce members of the CC chemokine family, and the recruitment of these cells is in turn controlled by CC chemokines (2). Multiple agonists can influence the expression of chemokines, including bacterial products and proinflammatory cytokines (3). In contrast to the wide belief that cytokines such as IL-1 and TNF-α are the main proinflammatory mediators induced by bacterial stimulants, chemokine genes show the highest induction in human monocytes in response to both Gram-positive and Gram-negative bacteria and their components (4, 5). Pathogen-associated molecular patterns (PAMPs) are diverse products with conserved motifs. PAMPs are produced by microorganisms, and often have an essential role in bacterial structure, and they activate the host immune system through a process that is mediated by Toll-like receptors (TLRs). Examples of PAMPs include Gram-negative (e.g., LPS) and Gram-positive (e.g., peptidoglycan, lipopeptide) bacterial components that activate TLR4 and TLR2, respectively (6, 7, 8, 9). LPS forms a complex with the serum protein LPS-binding protein, allowing its transfer to CD14 (10). CD14 is presumed to present LPS to TLR4 that is constitutively associated with an accessory protein, MD-2 (11, 12), thus enabling TLR4 to respond to LPS. In contrast to TLR4 molecules, which function as homodimers, signaling via TLR2 is dependent upon heterodimerization with other TLRs including TLR1 or TLR6 (13, 14, 15). TLRs share a common activation pathway mediated through their Toll-IL-1R signaling domain resulting in activation of NF-κB and mitogen-activated protein kinase (MAPK) (16, 17, 18). TLR2 and TLR4 signaling activates shared ‘core’ responses (7, 19, 20, 21), but the recent discovery that the cytoplasmic tails of TLR2 and TLR4 are not functionally equivalent, despite their high sequence homology, suggests that these receptors may also elicit receptor-specific signaling and inflammatory responses. TLR2 and TLR4 agonists cause the differential expression of a growing number of genes including IFN-β, IL-6, IL-12, IFN-γ, monocyte chemoattractant protein (MCP)-5, and macrophage-inflammatory protein (MIP)-2 in murine macrophages (22) and induce distinct patterns of cytokine production in RAW 264.7 macrophages (23, 24, 25), DCs (19), and mast cells (20). In keeping with these observations, stimulation with TLR2 and TLR4 agonists cause similar, but not identical, activation of MAPK (19, 24, 26), whereas treatment with specific kinase inhibitors indicates that p38 activation is involved in TLR4, but not TLR2, signaling (27). We have investigated whether the activation of monocytic cells via TLR2 or TLR4 could differentially modulate monocyte chemokine receptor expression, and therefore, potentially modulate recruitment of monocytes and monocyte-derived cells (such as DCs). Of the two major chemokine receptors expressed by monocytes, CCR1 and CCR2, there is evidence that TLR activation by commercial LPS (cLPS), which stimulates both TLR2 and TLR4, can cause internalization and degradation of CCR2 (28) and down-regulation of CCR2 mRNA through a reduction of message stability (29, 30). In this study, our principle aim was to determine how local and systemic infection and inflammation might affect chemokine receptor expression on monocytic cells. To this end, we compared the ability of selective TLR2 and TLR4 agonists to down-regulate CCR1 and CCR2, then focused on the regulation of CCR1, which has yet to be studied in detail in response to TLR engagement. Our findings indicate that in contrast to CCR2, TLR-induced down-regulation of CCR1 is mediated by cytokines such as MIP-1α, which upon binding to their cognate receptor, CCR1, trigger receptor loss. Moreover, our studies have revealed distinct differences in the capacity of TLR2 vs TLR4 agonists to sustain MIP-1α production in differentiated THP-1 cells, and consequently, CCR1 down-regulation. Cell culture reagents were purchased from Invitrogen (Paisley, U.K.), and general laboratory reagents were purchased from Sigma-Aldrich (Poole, U.K.). FCS with extremely low endotoxin levels (<0.5 EU/ml) was purchased from BioWhittaker (Verviers, Belgium). LPS from Escherichia coli serotype 0111:B4 was obtained from Sigma-Aldrich. Purified LPS (pLPS) from E. coli strain K235 was prepared as described (31). Synthetic bacterial-like lipopeptide Pam3CysSerLys4 (Pam3CSK4) was from EMC Microcollections (Tubingen, Germany). The human recombinant CC chemokine ligand (CCL)3, also known as MIP-1α, was purchased from PeproTech (London, U.K.). Cycloheximide (CHX) was obtained from Tocris (Baldwin, MO). The small molecule CCR1 antagonist UCB35625, the trans-isomer of J113863 (32) (patent W098/04554; Banyu Pharmaceutical, Tokyo, Japan) was a kind gift from Dr. M. Peck (UCB Pharma, Brussels, Belgium). Inhibitors of extracellular signal-regulated kinase (ERK) (PD98059), p38 (SB203580), and a MAPK negative control (SB202474) were purchased from Calbiochem (San Diego, CA), whereas the c-Jun N-terminal kinase (JNK) inhibitor (SP600125) was from Tocris. Cellfix was obtained from BD Biosciences (Cowley, Oxford, U.K.). Nitrocellulose membrane and ECL reagent for Western blotting was obtained from Amersham Biosciences (Chalfont St. Giles, U.K.). Human and mouse IgG were obtained from Sigma-Aldrich. FITC–labeled goat anti-mouse polyclonal F(ab′)2 were obtained from DAKO (Ely, U.K.). IgG1 (clone MOPC 21) and IgG2a (clone UPC 10) negative control Abs were obtained from Sigma-Aldrich. The mAbs 2D4 (anti-human CCR1) and 1D9 (anti-human CCR2) were kind gifts from Dr. S. Qin (Millennium Pharmaceuticals, Cambridge, MA). PE-conjugated anti-TLR2 mAb (clone TL2.1, isotype IgG2a), PE-conjugated anti-TLR4 mAb (clone HTA125, isotype IgG2a), and PE-conjugated CD14 mAb (clone 61D3, isotype IgG1) and isotype controls were from eBioscience (San Diego, CA). Anti-phospho ERK1/2, anti-total ERK1/2, anti-phospho JNK, and anti-total p38 were all purchased from Cell Signaling Technology (Beverly, MA). Anti-total JNK and anti-IκBα were purchased from Santa Cruz Biotechnology (Santa Cruz, CA), whereas anti-phospho p38 was from Promega (Southampton, U.K.). The anti-rabbit secondary Ab was obtained from Cell Signaling Technology. Peripheral venous blood was taken with informed consent from volunteers in accordance with a protocol approved by the South Sheffield Research Ethics Committee. Blood was anticoagulated with trisodium citrate, plasma and platelets removed by centrifugation, and following dextran sedimentation, PBMC were separated from granulocytes by centrifugation over sterile, endotoxin-free Histopaque 1077. Monocytes were further enriched by negative magnetic selection as described (33), using a mixture from StemCell Technologies (London, U.K.), containing Abs to CD2, CD3, CD19, CD56, CD66b, and glycophorin A, resulting in preparations typically containing 40–70% monocytes. The monocytic cell-line, THP-1, was obtained from the American Type Culture Collection (Manassas, VA) and grown according to their instructions. Forty-eight hours before an experiment, the cells were seeded at 8 × 104 cells/well into 96-well (for FACS analysis), or 8 × 105 cells/well for 6-well (for Western blotting), cell culture plates in medium supplemented with 80 nM 1α,25-dihydroxyvitamin D3 to induce CD14 expression (34). Cells were cultured for the specified times with Pam3CSK4 or pLPS at the doses indicated. For inhibitor experiments, the cells were preincubated for 40 min with either 5 μg/ml CHX, 100 nM UCB35625, 100 μM PD98059, 20 μM SP600125, or 10 μM SB203580 or SB202474 before stimulation with the specific TLR agonists. Cells were transferred onto ice and washed with ice-cold FACS buffer (10 mM PBS without Ca2+ and Mg2+, 10 mM HEPES and 0.25% BSA) before fluorescent staining with Abs labeled directly or indirectly. For direct staining, cells were blocked with mouse IgG (50 μg/ml) for 10 min at room temperature, then stained with a 1/10 dilution of PE-anti-TLR2, PE-anti-TLR4, PE-anti-CD14, or their isotype controls, for 45 min at 4°C. For indirect staining, cells were first blocked with human IgG (50 μg/ml) for 10 min at room temperature, and then stained with primary Ab (10 μg/ml anti-human CCR1 Ab or mouse isotype-matched control IgG1) for 45 min at 4°C. Cells were then washed once with FACS buffer and stained with a FITC–conjugated secondary Ab (50 μg/ml) for 15 min at 4°C. In both methods, the cells were washed a final time with FACS buffer and fixed using 1× Cellfix (BD Biosciences). Flow cytometry was performed on a dual-laser FACSCaliber (BD Biosciences) using CellQuest software (BD Biosciences). Supernatants from cell culture were harvested and stored at −20°C until assayed. Immunoreactive MIP-1α was measured by ELISA using matched Ab pairs purchased from R&D Systems (Abingdon, U.K.), the detection limit was 20 pM. Western blot analysis was conducted as described (35). Briefly, equal amounts of protein (10 μg) were resolved by 10% SDS-polyacrylamide gel electrophoresis, transferred onto nitrocellulose membranes, and nonspecific binding blocked. The membranes were incubated overnight with anti-phospho ERK1/2 (1/1000), anti-total ERK1/2 (1/5000), anti-phospho JNK (1/500), anti-total JNK (1/30,000) anti-phospho p38 (1/1000), anti-total p38 (1/1000) or anti-IκBα (1/10,000). The Ab-Ag complexes were detected using an HRP-coupled anti-rabbit secondary Ab (1/2000) that was subsequently detected by ECL. Films were densitometrically analyzed using NIH Image (version 1.62f). THP-1 cell RNA was isolated using RNeasy columns following the manufacturer’s instructions (Qiagen, Crawley, U.K.), and the RNA concentration was then determined by spectrophotometry at an absorbance of 260 nm. RPAs were conducted on 1.5 μg of RNA in each RPA sample, using the RiboQuant hCK-5 multiprobe template set, and following the RiboQuant protocol (BD PharMingen, Cowley, Oxford, U.K.). The hCK-5 probe set hybridized with target human mRNAs encoding I-309 (CCL1), MCP-1 (CCL2), MIP-1α (CCL3), MIP-1β (CCL4), RANTES (CCL5), IL-8 (CXC chemokine ligand (CXCL)8), IFN-γ-inducible protein (IP)-10 (CXCL10), lymphotactin (C chemokine ligand (XCL)1), as well as the two housekeeping gene products, L32 and GAPDH. Gels were autoradiographed and results were quantified densitometrically using NIH Image (version 1.62f). Densitometric values for each mRNA analyzed were normalized to GAPDH values for each particular mRNA. The data are presented as mean ± SEM of at least three independent experiments on separate donors or cell culture passages. Data were analyzed according to the statistical test stated using the Prism 3.0 program (GraphPad, San Diego, CA). Commercial LPS preparations contain contaminating bacterial lipoproteins, and as a result activate both TLR2 and TLR4 (31). Therefore, synthetic Pam3CSK4 and pLPS (free of such contaminants), which selectively activate TLR2/1 heterodimers and TLR4, respectively, were used to differentiate between TLR2- and TLR4-dependent actions. We first confirmed that primary human monocytes express TLR2, TLR4, and CD14 on their cell surface (Fig. 1⇓A) and that stimulation with cLPS (10 μg/ml) causes a substantial decrease in CCR2 staining compared with untreated cells (Fig. 1⇓B). We then extended this work to show that selective TLR2 and TLR4 agonists also caused significant, dose-dependent reductions in the cell surface expression of CCR2 at 20 h (Fig. 1⇓C). TLR activation significantly reduces the cell surface expression of CCR2 on primary human monocytes and THP-1 cells. 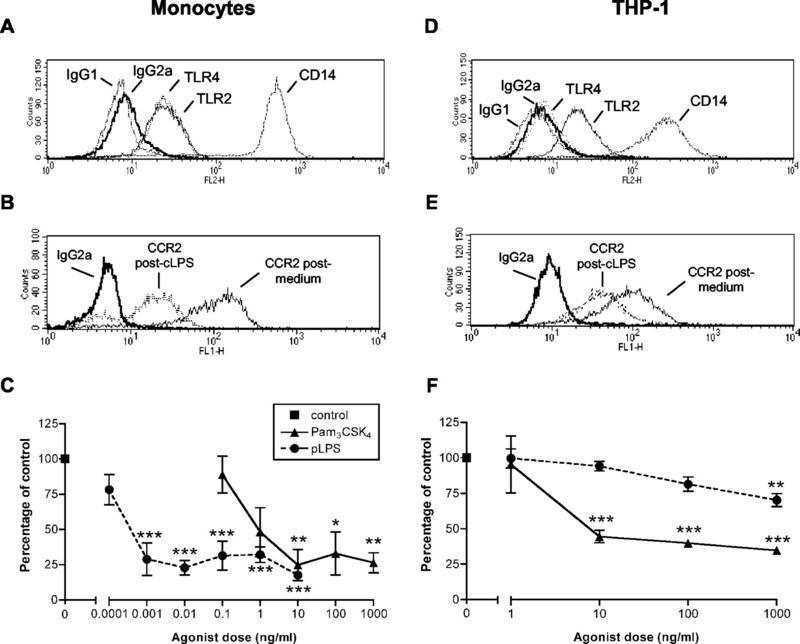 Surface expression levels of TLR2, TLR4, and CD14 on purified primary human monocytes (A) and differentiated THP-1 cells (D), were measured by flow cytometric analysis after staining the cells with the anti-TLR2, anti-TLR4, or anti-CD14 Abs indicated, compared with isotype control staining. Cell surface expression of CCR2 was subsequently determined by flow cytometry using an anti-CCR2 mAb. An illustrative histogram demonstrating the down-regulation of CCR2 expression in response to commercial LPS is shown in monocytes (B) or THP-1 cells (E). Monocytes (C) and THP-1 cells (F) were then treated with buffer (▪; control cells), or increasing amounts of the TLR2 agonist Pam3CSK4 (▴) or the TLR4 agonist pLPS (•) for 20 h. C, Data are mean ± SEM of three to four experiments on monocytes from separate donors, whereas (F) are mean ± SEM of three to five experiments, each from a separate THP-1 cell passage. Both are expressed as percentage change from control cells (after subtraction of nonspecific binding of isotype-matched control). Significant differences between control and Pam3CSK4 or pLPS are indicated; ∗, p < 0.05, ∗∗, p < 0.01, or ∗∗∗, p < 0.001, analyzed by ANOVA and Tukey’s posttest. Differentiated THP-1 cells similarly expressed TLR2 and CD14 on their cell surface, whereas TLR4 was typically expressed at levels too low to be evident by flow cytometry (Fig. 1⇑D). Levels of TLR2 and TLR4 were higher on undifferentiated cells and decreased with vitamin D3-induced differentiation (data not shown). These cells also show decreased CCR2 staining in response to cLPS (10 μg/ml) stimulation (Fig. 1⇑E); however, a higher dose of selective TLR4 agonist (pLPS) was necessary to cause a significant decrease in CCR2 cell surface expression when compared with primary human monocytes, whereas a similar dose-response to the selective TLR2 agonist (Pam3CSK4) was observed (Fig. 1⇑F). Primary human monocytes also expressed CCR1 on their cell surface (Fig. 2⇓A).We found that like CCR2, expression of CCR1 was decreased by treatment with cLPS (1 μg/ml) (Fig. 2⇓A). When the effect of the selective TLR agonists was examined, we found that they also caused significant, dose-dependent reductions in the cell surface expression of CCR1 at 2 h (Fig. 2⇓B), which was maintained at 20 h (Fig. 2⇓C). THP-1 cells also expressed CCR1, which was down-regulated in response to cLPS (1 μg/ml) treatment (Fig. 3⇓A). 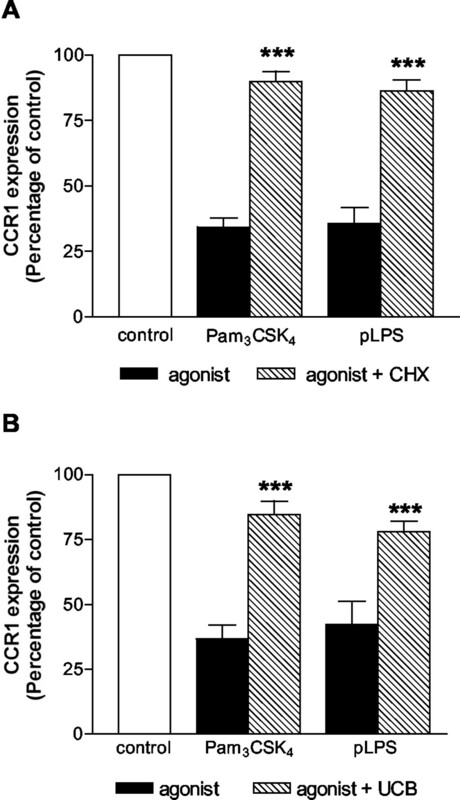 The two selective agonists again caused a significant, dose-dependent reduction in the cell surface expression of CCR1. Purified LPS induced an equivalent early down-regulation of CCR1 at 2 h in both THP-1 cells and monocytes (Fig. 3⇓B), but after 20 h, Pam3CSK4 induced greater down-regulation of CCR1 in THP-1 cells compared with pLPS (Fig. 3⇓C). In the THP-1 cells treated with pLPS, some recovery of CCR1 expression was observed at 20 h, whereas Pam3CSK4-induced receptor loss had increased over time (Fig. 3⇓C). The pattern of CCR1 loss was similar to that of CCR2, with pLPS more efficacious in monocytes than THP-1 cells. TLR activation significantly reduces the cell surface expression of CCR1 on primary human monocytes. Purified primary human monocytes were treated with buffer (▪; control cells), or increasing amounts of the TLR2 agonist Pam3CSK4 (▴) or the TLR4 agonist pLPS (•) for 2 (B) or 20 (C) h. Cell surface expression of CCR1 was subsequently determined by flow cytometry using an anti-CCR1 mAb. An illustrative histogram (A) demonstrating the down-regulation of CCR1 expression in response to cLPS is shown. B and C, Data are mean ± SEM of three to four experiments, from separate donors, and are expressed as percentage change from control cells (after subtraction of nonspecific binding of isotype-matched control). Significant differences between control and Pam3CSK4 or pLPS are indicated; ∗∗, p < 0.01 and ∗∗∗, p < 0.001, as analyzed by ANOVA and Tukey’s posttest. TLR activation significantly reduces the cell surface expression of CCR1 on THP-1 cells. Differentiated THP-1 cells were treated with buffer (▪; control cells), or increasing amounts of the TLR2 agonist Pam3CSK4 (▴) or the TLR4 agonist pLPS (•) for 2 (B) or 20 (C) h. Cell surface expression of CCR1 was subsequently determined by flow cytometry using an anti-CCR1 mAb. An illustrative histogram (A) demonstrating the down-regulation of CCR1 expression in response to cLPS is shown. B and C, Data are mean ± SEM of three to five experiments, each from a separate cell passage, and are expressed as percentage change from control cells (after subtraction of nonspecific binding of isotype-matched control). Significant differences between control and Pam3CSK4 or pLPS are indicated; ∗∗∗, p < 0.001, as analyzed by ANOVA and Tukey’s posttest. Because chemokine generation is a classical response to bacterial stimulation (4), we investigated whether TLR-induced CCR1 down-regulation was a direct effect, as has been reported for CCR2 in LPS-stimulated monocytes (28, 29, 30), or was mediated in an autocrine/paracrine manner by local chemokine release. A concentration (1 ng/ml) of Pam3CSK4 or pLPS causing the significant (>50%; p < 0.001) down-regulation of CCR1 expression on THP-1 cells at 2 h (Fig. 3⇑B) was chosen for this and all subsequent experiments. Despite the fact that 1 ng/ml Pam3CSK4 or pLPS caused identical down-regulation of CCR1 cell surface expression, the two agonists caused the differential release of the endogenous CCR1 ligand MIP-1α from THP-1 cells. 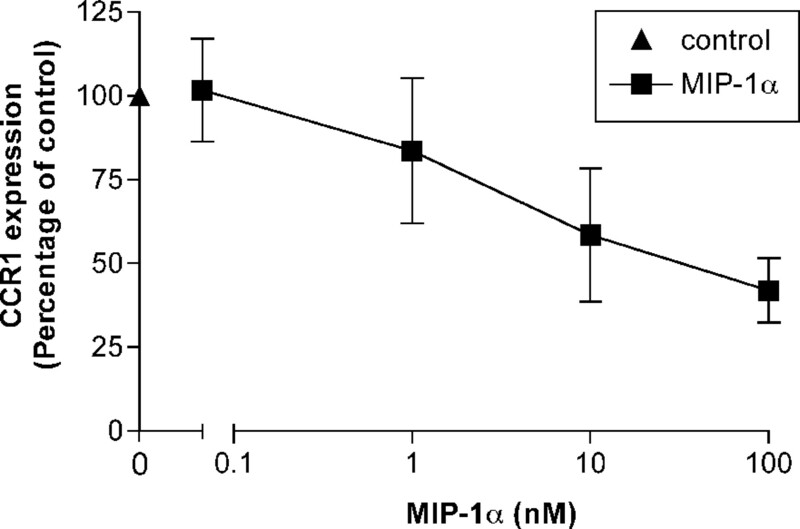 Low (picomolar) levels of MIP-1α were released in response to either Pam3CSK4 or pLPS at 2 h (Fig. 4⇓A), yet by 20 h, a 6.5-fold further increase in MIP-1α was detected in response to Pam3CSK4 only (Fig. 4⇓B). To determine whether these concentrations were sufficient to down-regulate CCR1 expression, we investigated the effect of direct stimulation of THP-1 cells with exogenous MIP-1α. A dose-dependent loss of CCR1 expression was observed at 2 h (Fig. 5⇓), but this occurred at considerably higher concentrations of MIP-1α than those detected in response to TLR activation. A >50% decrease in cell surface expression of CCR1 was induced by 100 nM MIP-1α, ∼200-fold greater than the concentration detected in Pam3CSK4-stimulated cells at 2 h, and 25-fold greater than the concentration at 20 h.
TLR stimulation causes MIP-1α release from differentiated THP-1 cells. Cell supernatants were removed 2 (A) or 20 (B) h after treatment with 1 ng/ml Pam3CSK4 or pLPS and assayed for MIP-1α release by ELISA. Data shown are mean ± SEM of four experiments conducted in duplicate, each from a separate cell passage, and are expressed as picomolar of release. Significant differences between control and Pam3CSK4 or pLPS are indicated; ∗∗, p < 0.01 and ∗∗∗, p < 0.001, and differences between Pam3CSK4 and pLPS are indicated; #, p < 0.05 and ###, p < 0.001, as analyzed by ANOVA and Tukey’s posttest. Higher levels of exogenous MIP-1α, compared with released TLR-induced MIP-1α, are necessary to cause a >50% loss of CCR1 cell surface expression on THP-1 cells. The cell surface expression of CCR1 on differentiated THP-1 cells, following treatment for 2 h with buffer (▴) or increasing amounts of the CCR1 ligand, MIP-1α (▪), was determined by flow cytometry using an anti-CCR1 mAb. Data shown are mean ± SEM of three experiments, each from a separate cell passage, and are expressed as percentage change from control cells (after subtraction of nonspecific binding of isotype-matched control). To determine whether the TLR2- and TLR4-induced reduction in CCR1 expression was dependent on protein synthesis, THP-1 cells were pretreated with CHX (5 μg/ml, a concentration optimized to block protein synthesis without causing cell death; data not shown) for 40 min, before addition of the TLR agonists for 2 h. CHX prevented the decrease in CCR1 expression in response to Pam3CSK4 and pLPS (Fig. 6⇓A), indicating a protein synthesis-dependent mechanism of cell surface receptor loss. Protein synthesis inhibition and CCR1 blockade both prevent the TLR-induced reduction of CCR1 expression. Differentiated THP-1 cells were pretreated with CHX (5 μg/ml) (A), UCB35625 (UCB; 100 nM) (B), or buffer for 40 min, followed by buffer or 1 ng/ml Pam3CSK4 or pLPS for 2 h. The cell surface expression of CCR1 was subsequently determined by flow cytometry using an anti-CCR1 mAb. Data shown are mean ± SEM of three to five experiments, each from a separate cell passage, and are expressed as percentage change from control cells (after subtraction of nonspecific binding of isotype-matched control). Significant differences between agonist and agonist plus CHX/UCB35625 are indicated; ∗∗∗, p < 0.001, as analyzed by ANOVA and Tukey’s posttest. Because down-regulation of CCR1 was both rapid and protein synthesis-dependent, we hypothesized that levels of MIP-1α measurable in THP-1 culture supernatants might underestimate local ligand concentrations and that measuring supernatants could, in fact, be misleading. Thus, to determine whether an autocrine effect of high, localized chemokines was responsible for the CCR1 down-regulation, we used a small molecule CCR1 antagonist, UCB35625, to block CCR1 function before stimulation with the TLR agonists. Pretreatment of THP-1 cells for 40 min with UCB35625 prevented the reduction of CCR1 expression at 2 h in response to Pam3CSK4 and pLPS (Fig. 6⇑B), suggesting that CCR1 ligands induced by TLR2- or TLR4-engagement down-regulate CCR1 expression in an autocrine manner. Treatment of THP-1 cells with Pam3CSK4 and pLPS at 1 ng/ml induced similar early down-regulation of CCR1, but different delayed patterns of MIP-1α generation (as shown in Fig. 4⇑). To investigate whether this prolonged induction of chemokines in response to TLR2 activation was secondary to differential induction of chemokine mRNAs, several chemokine genes, including MIP-1α, were studied at the mRNA level using an RPA. As shown in Fig. 7⇓, A and B, TLR stimulated chemokine mRNA expression. IL-8 (CXCL8) was rapidly induced within 30 min and was maximal by 1 h, whereas there was very little MIP-1α (CCL3) mRNA expression at 30 min, but maximal induction was observed by 1 h. MIP-1β (CCL4) was also induced by 1 h and was maximally induced at 2 h, and finally, RANTES (CCL5) showed maximal induction at 2 h. At the later time points, mRNA expression levels of the CCR1 chemokine ligands MIP-1α and RANTES appeared greater at 4 and 24 h after treatment with Pam3CSK4, compared with pLPS, although these differences were not statistically significant. MIP-1β and IL-8, ligands for CCR5 and CXCL1/2, respectively, showed almost identical induction by Pam3CSK4 and pLPS. In THP-1 cells, Pam3CSK4 and pLPS did not induce the chemokine genes IP-10 (CXCL10) or MCP-1 (CCL2), ligands for CXCR3 and CCR2, respectively. In control experiments for hybridization specificity, 1.5 μg of yeast transfer RNA was hybridized and processed in an identical manner to the sample RNA, and no signals corresponding to any of the target human mRNAs were detected (data not shown). TLR induced chemokine mRNA expression. Differentiated THP-1 cells were incubated for the indicated times with 1 ng/ml Pam3CSK4 or pLPS and mRNA transcripts for chemokines analyzed by RPA (A) using the RiboQuant hCK-5 multiprobe template set. Films were densitometrically analyzed and data presented in graphical form (B) as mean ± SEM of three experiments, each from a separate cell passage, and converted to percentage values of the GAPDH values for the particular mRNA. No significant differences between Pam3CSK4- and pLPS-treated cells were detected, as analyzed by ANOVA and Bonferroni’s posttest. The ability of TLR activation to cause a reduction in the cell surface expression of CCR1 was therefore consistent with the generation of CCR1 ligands acting in an autocrine manner. As previously shown, Pam3CSK4 caused a more sustained induction of MIP-1α protein than purified LPS; thus, we sought evidence for different patterns of activation of downstream signaling molecules, which might underlie the differential induction of the MIP-1α gene, focusing on MAPK pathways and activation of NF-κB. TLR activation triggered induction of the MAPK signaling pathways: p38, ERK, and JNK (Fig. 8⇓, A–C, respectively), with TLR4 stimulation by pLPS causing a more rapid activation of the MAPK than TLR2 stimulation by Pam3CSK4. This was primarily evident with respect to p38 and JNK phosphorylation, in which a significantly greater phosphorylation was observed at 15 min in response to TLR4 activation, compared with TLR2 activation. TLR4 activation also appeared to induce more rapid phosphorylation of ERK, although this was not statistically significant. TLR2 activation of ERK, although onsetting at a slower rate, appeared more sustained and was greater than that induced by pLPS after 60 min of stimulation. 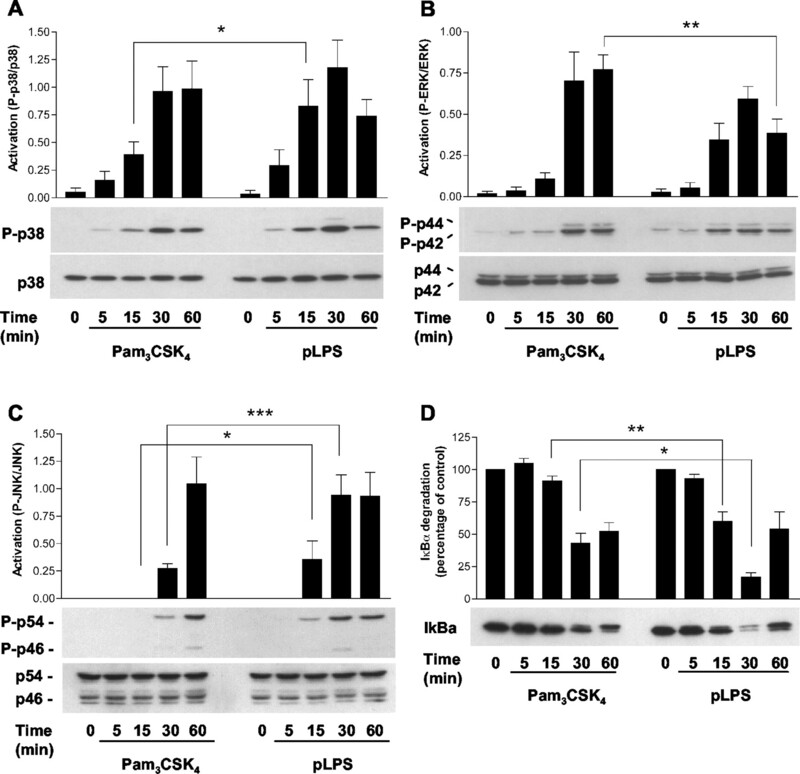 Purified LPS activates MAPK signaling pathways and causes IκBα degradation more rapidly and effectively than Pam3CSK4. Differentiated THP-1 cells were incubated for the indicated times with 1 ng/ml Pam3CSK4 or pLPS. Whole cell lysates were analyzed by Western blot using Abs specific for the total and phosphorylated forms of p38 (A), ERK (p42/44) (B), JNK (p46/54) (C), or total IκBα (D). Films were densitometrically analyzed and the data were presented as mean ± SEM of four experiments each from a separate cell passage, with a representative blot beneath the graph. A–C, For the MAPK, the ratio of phosphorylated vs nonphosphorylated forms was presented, whereas for IκBα (D) total p38 was used as a control for loading, and the data then expressed as percentage change from control cells. Significant differences between Pam3CSK4- and pLPS-treated cells are indicated; ∗, p < 0.05, ∗∗, p < 0.01, and ∗∗∗, p < 0.001, analyzed by ANOVA and Bonferroni’s posttest. In resting cells the transcription factor NF-κB exists mainly in the cytosol in which it is bound to IκBα. Upon cell activation, IκBα is phosphorylated, ubiquitinated, and then degraded leading to the release of NF-κB, which subsequently translocates to the nucleus and causes inflammatory gene transcription (36, 37). Therefore, activation of the NF-κB pathway was measured using degradation of IκBα as a marker. TLR4 stimulation caused a significantly faster and greater degradation of IκBα than TLR2 stimulation by Pam3CSK4 (Fig. 8⇑D). We then investigated the consequence of direct antagonism of the MAPK pathways on regulation of chemokine receptor expression by TLR2 and TLR4 agonists and found that MAPK signaling pathway inhibitors were able to prevent TLR-induced CCR1 down-regulation (Fig. 9⇓). Blockade of the ERK pathway using PD98059, a selective and cell-permeable inhibitor of the upstream kinase MAP/ERK kinase, and using SB203580, a highly specific and cell-permeable inhibitor of p38 kinase, caused significant inhibition of CCR1 down-regulation in response to both TLR2 and TLR4 activation. The MAPK negative control, SB202474, did not affect Pam3CSK4- or pLPS-induced CCR1 down-regulation. The effect of signaling pathway inhibitors on the TLR-induced reduction of CCR1 expression. Differentiated THP-1 cells were pretreated with an ERK inhibitor (PD98059; 100 μM), p38 inhibitor (SB203580; 10 μM), JNK inhibitor (SP600125; 20 μM), MAPK negative control (SB202474; 10 μM), or buffer for 40 min. Pretreatment was followed by buffer or 1 ng/ml Pam3CSK4 or pLPS for 2 h. The cell surface expression of CCR1 was subsequently determined by flow cytometry using an anti-CCR1 mAb. Data shown are mean ± SEM of four experiments, each from a separate cell passage, and are expressed as percentage change from control cells (after subtraction of nonspecific binding of isotype-matched control). Significant differences between agonist and agonist plus inhibitor are indicated; ∗, p < 0.05 and ∗∗∗, p < 0.001, as analyzed by ANOVA and Tukey’s posttest. The selective recruitment of monocytes to sites of inflammation is critical for establishing host defense against infectious agents, with chemokines and chemokine receptors pivotal to orchestrating an effective inflammatory response to TLR activation by pathogens. Although a great deal of information is available regarding chemokine gene expression, only a few studies have examined the regulation of chemokine receptor expression by PAMPs. CCR1 and CCR2 are the major chemokine receptors expressed on monocytes and are also expressed on monocyte-derived cells, such as DCs (38). In this study, we report the ability of selective TLR2 and TLR4 agonists to down-regulate CCR1 and CCR2, and then show the first comparative investigation of the individual roles of TLR in the regulation of monocyte CCR1 expression. To date, the majority of interest in regulation of monocyte chemokine receptor expression has focused on CCR2, and it has been shown previously that cLPS causes internalization and degradation of CCR2 (28) and down-regulation of CCR2 mRNA through a reduction in message stability (29, 30). It has also been reported that TLR engagement by cLPS decreases steady-state CCR1 RNA levels at 3 h in THP-1 cells, a monocytic cell line (30) and at 4 h in human monocytes (29). However, these studies were conducted using cLPS, which is now known to act on both TLR2 and TLR4 (31). Thus, the potential for, and mechanisms used by, each of these TLRs in the regulation of CCR1 expression is presently unknown. In recent studies, we have shown that TLR2 and TLR4 mediate shared and separate actions on both monocytes and neutrophils (39), reinforcing the need to dissect these critical processes regulating leukocyte recruitment and function. Therefore, we have extended this work to show that activation of TLR1/2 heterodimers by Pam3CSK4, and TLR4 homodimers by the Gram-negative agonist, pLPS, causes down-regulation of the cell surface expression of CCR1 and CCR2 in both human monocytes and THP-1 cells. A direct comparison of the potency of purified bacterial products is difficult due to the problems of calculating LPS molarities and to the uncertainties regarding binding affinities of TLR stimulators for their receptors. However, our data appear to show that pLPS is more efficacious than Pam3CSK4 at inducing CCR1 and CCR2 down-regulation in monocytes, whereas in direct contrast, THP-1 cells show identical decreases in the cell surface expression of CCR1 at 2 h, but down-regulation of both receptors only in response to Pam3CSK4, or a very high dose of pLPS, at 20 h. One possible explanation is that TLR2 and TLR4 expression levels differ on primary human monocytes and THP-1 cells. Indeed we confirmed that although both primary human monocytes and undifferentiated THP-1 cells express TLR2 and TLR4 on their cell surface, expression of TLR4 on THP-1 cells is much lower than that on monocytes, and in our experiments we were unable to see reliable expression of TLR4 on the surface of differentiated THP-1 cells. Nonetheless, THP-1 cells respond well to the selective TLR4 agonist pLPS at the 2 h time point, and TLR4 can function effectively at low expression levels (e.g., a few hundred receptors per cell; Ref. 40). This is analogous to the IL-1R1, which uses similar intracellular signaling pathways to TLRs, and in which binding data suggest that the maximal biological response can be elicited from T cells in response to as few as one to ten molecules of IL-1β bound per cell (41). The observation that TLR2- and TLR4-induced down-regulation of CCR1 is fairly comparable in THP-1 cells at 2 h, but is very different at 20 h, also suggests the possibility that TLR4 signaling is down-regulated in THP-1 cells over time, such that TLR4-mediated signaling falls below a required threshold for stimulation. In fact, Martin et al. (42) previously reported that treatment of vitamin D3-differentiated THP-1 cells for 24 h with pLPS resulted in decreased TLR4 expression, whereas stimulation with a TLR2 agonist for 24 h did not affect TLR2 expression. In contrast, Medvedev et al. (43) found that an 18-h exposure of human monocytes to pLPS failed to alter expression of membrane-associated TLR4, which may explain our finding that CCR1 and CCR2 down-regulation is maintained in human monocytes at 20 h, in response to pLPS stimulation. THP-1 cells were subsequently used as a model system to investigate further the mechanisms of CCR1 down-regulation because this is the less studied of the two monocytic chemokine receptors with respect to TLR activation, yet is an important receptor in the regulation of monocytic cell recruitment. In response to a concentration of TLR agonist (1 ng/ml) that caused a significant decrease in CCR1 cell surface expression at 2 h in THP-1 cells, we detected generation of the CCR1 ligand MIP-1α (CCL3) by these cells. The increase in MIP-1α production at 20 h was highly significant in response to Pam3CSK4 treatment, but not pLPS, suggesting a differential induction of chemokine release in response to these two TLR agonists. Interestingly, we also observed differences in the regulation of CCR1 on THP-1 cells at 20 h, when a significant down-regulation in expression was only detected in response to Pam3CSK4. This correlation in ligand generation and receptor down-regulation was the basis of further work to ascertain the molecular mechanism(s) of TLR-induced CCR1 down-modulation. Our data revealed that CHX pretreatment completely abolished both Pam3CSK4- and pLPS-induced CCR1 loss at 2 h on THP-1 cells, indicating that de novo protein synthesis is involved in the down-regulation of CCR1. We then investigated the ability of the CCR1 small molecule antagonist, UCB35625, to modify CCR1 cell surface expression. This compound inhibits CCR1 signaling induced by MIP-1α and other CCR1 ligands, in a noncompetitive manner (32), and it effectively prevented the TLR-induced decrease in CCR1 expression. Although pLPS and Pam3CSK4 showed some differences in the amount of MIP-1α released into the culture supernatant at 2 h, taken together these data strongly support the hypothesis that a direct interaction between CCR1 and its ligands is required for TLR-mediated CCR1 down-regulation. An alternative theory is that TLR activation could result in CCR1 down-regulation by ligand-independent activation of internalization machinery, and in this model, UCB35625 could stabilize CCR1 in a conformation in which interaction with this machinery is impaired. However, the combination of data from the experiments with CHX and with UCB35625 favor a model in which an autocrine loop involving the release of a high, localized concentration of MIP-1α or other CCR1 ligands (such as RANTES) is responsible for CCR1 down-modulation. In keeping with our data, Sallusto et al. (38) found that cLPS-induced down-regulation of CCR1 in DCs was also due to chemokine release and inhibited by CHX. Importantly, exogenous MIP-1α had to be added at much higher concentrations than those induced by TLR stimulation to reproduce the same magnitude of decreased CCR1 expression. Therefore, our data suggest that measurement of supernatant cytokine concentration alone can be misleading, and that local concentrations of chemokines around the cell from which they are released may be considerably higher than in the supernatant. Similar work by Xu et al. (28), which examined the regulation of monocyte CCR2 expression by commercial LPS, reported that the concentration of MCP-1 (CCL2) needed to induce CCR2 receptor internalization was 100–500 times greater than the amount detected in monocyte-cultured supernatants 2 h after cLPS stimulation, but they observed that CHX treatment failed to prevent cLPS-induced CCR2 down-regulation. This led the authors to suggest that ligand generation was not involved in CCR2 down-regulation. In fact, our work on CCR2 supports this because we detected no MCP-1 mRNA induction (using RPA; Fig. 7⇑A), or protein release at 2 or 20 h (using ELISA; data not shown), after TLR stimulation by cLPS, pLPS, or Pam3CSK4, although we did not investigate other CCR2 ligands such as MCP-3 (CCL7) or MCP-4 (CCL13). We therefore suggest that the two major chemokine receptors on monocytes can be down-modulated by different mechanisms, with CCR1 down-regulated by an indirect mechanism that is dependent on ligand generation, whereas CCR2 down-regulation is a direct mechanism and has been found to be dependent upon tyrosine kinase activation and serine proteinases (28). Although a substantial induction of mRNA for several chemokines was elicited by TLR stimulation (as determined by RPA), no significant differences were observed between the mRNA profiles induced by TLR2 vs TLR4 activation. This may suggest that MIP-1α synthesis is regulated at least in part at the level of translation to protein. 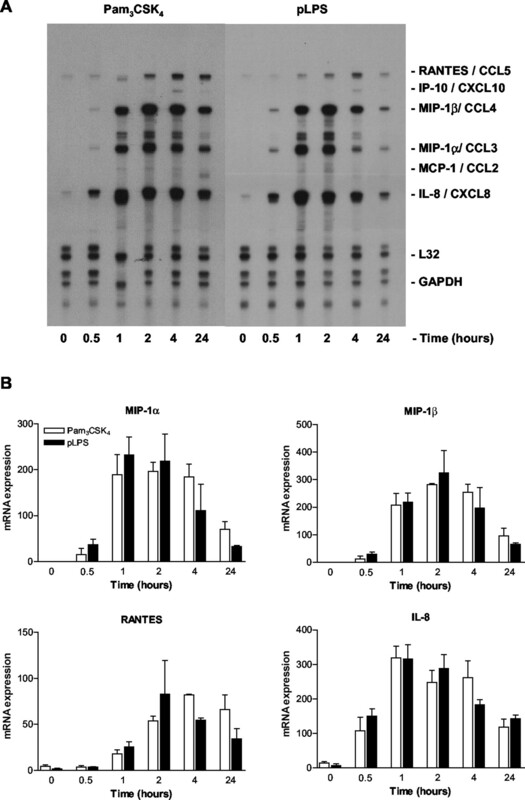 Interestingly, a trend toward increased mRNA levels for the CCR1 ligands MIP-1α (CCL3) and RANTES (CCL5) was observed 4 h and 24 h after TLR2 stimulation. This correlates with MIP-1α protein levels and may reflect the ability of Pam3CSK4 to cause enhanced CCR1 ligand generation, and thus CCR1 down-modulation, at later time points. As previously noted, we saw no increase in mRNA expression of the CCR2 ligand MCP-1. TLR2 and TLR4 agonists can cause striking differences in the gene transcription of a growing number of genes including IFN-β, inducible NO synthase, IL-6, IL-8, IL-12, IFN-γ, RANTES, IP-10, MCP-5, and MIP-2 in murine macrophages (22), RAW 264.7 macrophages (23, 24, 25), DCs (19), and mast cells (20). Therefore, our further studies investigated the degree of equivalence in TLR2 and TLR4 signaling with respect to induction of chemokine receptor loss in THP-1 cells. Subtle, but statistically significant, differences were found in the signaling components we studied in response to selective TLR2 or TLR4 activation, using a concentration of Pam3CSK4 and pLPS that induced identical CCR1 down-regulation. Purified LPS caused a more rapid phosphorylation of p38 and JNK, and degradation of IκBα, than Pam3CSK4. In contrast, ERK activation by TLR2 appeared to be more sustained than that induced by TLR4. Variations in rates of MAPK activation have been shown previously for p38 in RAW 264.7 mouse macrophages, in which a TLR4 agonist also caused phosphorylation earlier than the TLR2 agonist (25). However, identical induction profiles have been reported for ERK, NF-κB, and AP-1 in RAW 264.7 cells (24), and for p38, ERK, JNK, and NF-κB in human DCs (19). To clarify further the specific roles of individual signaling pathways in CCR1 down-regulation, we used specific pathway inhibitors for the MAPK. Blocking the ERK and p38 pathways caused partial inhibition of CCR1 down-modulation in response to TLR2 and TLR4 activation, and this was also seen using the JNK pathway inhibitor SP600125 (44) (data not shown). Again, conflicting data have been published regarding the effects of MAPK inhibitors following TLR stimulation. For example, blocking the p38 pathway with SB203580 before TLR4 stimulation decreased cytokine production from human monocytes, but had no effect on cytokine production elicited by TLR2 activation, leading the authors to suggest that TLR2 signaling does not involve the p38 signaling pathway (27). However, a second group found that SB203580 partially inhibits TLR2- and TLR4-induced secretory IL-1R antagonist gene expression in RAW 264.7 cells (25). In summary, we have shown that selective TLR2 and TLR4 agonists down-regulate two major chemokine receptors, CCR1 and CCR2, on monocytic cells and that CCR1 is down-regulated by an indirect mechanism, whereby activation of TLR2 or TLR4 creates an autocrine loop, with the de novo synthesis and consequent release of localized high amounts of CCR1 ligand. We also observed differences between TLR2- and TLR4-induced activation of THP-1 cells. At 20 h, a loss of cell surface expression of both receptors was detected only in response to Pam3CSK4, or a very high dose of pLPS, which correlated with the higher expression of TLR2 compared with TLR4, and the greater generation of the CCR1 ligand MIP-1α. The different mechanisms of chemokine receptor regulation highlighted by this work are likely to be important in the control of trafficking, recruitment, and subsequent activation of monocytic inflammatory cells including DCs and monocytes. We thank Dr. Peter Jose and Gill Martin (Imperial College, London, U.K.) for performing the ELISA, Dr. Vanessa Singleton (University of Sheffield, Sheffield, U.K.) for assistance with the RPA, Dr. Sudheer Alapati (University of Sheffield, Sheffield, U.K.) for technical assistance, and Dr. James Pease (Imperial College, London, U.K.) for critical review of the manuscript. ↵1 This work was supported by an Arthritis Research Campaign (U.K.) Project Grant S0666 and the Medical Research Council (U.K.) by a Clinician Scientist Fellowship G108/388 (to I.S.). S.N.V. is supported by the National Institutes of Health Grant AI-18797. ↵3 Abbreviations used in this paper: DC, dendritic cell; CCL, CC chemokine ligand; CHX, cycloheximide; ERK, extracellular signal-regulated kinase; IP-10, IFN-γ-inducible protein 10; JNK, c-Jun N-terminal kinase; MIP-1α, macrophage-inflammatory protein-1α; CXCL, CXC chemokine ligand; RPA, RNase protection assay; MAPK, mitogen-activated protein kinase; Pam3CSK4, S-[2,3-bis(palmitoyloxy)-(2-RS)-propyl]-N-palmitoyl-(R)-Cys-Ser-Lys4-OH trihydrochloride; PAMP, pathogen-associated molecular pattern; MCP, monocyte chemoattractant protein; pLPS, purified LPS; cLPS, commercial LPS; TLR, Toll-like receptor. Luster, A. D.. 1998. Chemokines: chemotactic cytokines that mediate inflammation. N. Engl. J. Med. 338:436. Kinne, R. W., R. Brauer, B. Stuhlmuller, E. Palombo-Kinne, G. R. Burmester. 2000. Macrophages in rheumatoid arthritis. Arthritis Res. 2:189. Ciesielski, C. J., E. Andreakos, B. M. Foxwell, M. Feldmann. 2002. TNFα-induced macrophage chemokine secretion is more dependent on NF-κB expression than lipopolysaccharides-induced macrophage chemokine secretion. Eur. J. Immunol. 32:2037. Wang, Z. M., C. Liu, R. Dziarski. 2000. Chemokines are the main proinflammatory mediators in human monocytes activated by Staphylococcus aureus, peptidoglycan, and endotoxin. J. Biol. Chem. 275:20260. Salkowski, C. A., G. Detore, A. Franks, M. C. Falk, S. N. Vogel. 1998. Pulmonary and hepatic gene expression following cecal ligation and puncture: monophosphoryl lipid A prophylaxis attenuates sepsis-induced cytokine and chemokine expression and neutrophil infiltration. Infect. Immun. 66:3569. Sabroe, I., R. C. Read, M. K. B. Whyte, D. H. Dockrell, S. N. Vogel, S. K. Dower. 2003. Toll-like receptors in health and disease: complex questions remain. J. Immunol. 171:1630. Yang, H., D. W. Young, F. Gusovsky, J. C. Chow. 2000. Cellular events mediated by lipopolysaccharide-stimulated Toll-like receptor 4: MD-2 is required for activation of mitogen-activated protein kinases and Elk-1. J. Biol. Chem. 275:20861. Hajjar, A. M., D. S. O’Mahony, A. Ozinsky, D. M. Underhill, A. Aderem, S. J. Klebanoff, C. B. Wilson. 2001. Cutting edge: functional interactions between Toll-like receptor (TLR) 2 and TLR1 or TLR6 in response to phenol-soluble modulin. J. Immunol. 166:15. Wyllie, D. H., E. Kiss-Toth, A. Visintin, S. C. Smith, S. Boussouf, D. M. Segal, G. W. Duff, S. K. Dower. 2000. Evidence for an accessory protein function for Toll-like receptor 1 in anti-bacterial responses. J. Immunol. 165:7125. Beutler, B.. 2000. TLR4: central component of the sole mammalian LPS sensor. Curr. Opin. Immunol. 12:20. Means, T. K., D. T. Golenbock, M. J. Fenton. 2000. The biology of Toll-like receptors. Cytokine Growth Factor Rev. 11:219. Anderson, K. V.. 2000. Toll signaling pathways in the innate immune response. Curr. Opin. Immunol. 12:13. Supajatura, V., H. Ushio, A. Nakao, S. Akira, K. Okumura, C. Ra, H. Ogawa. 2002. Differential responses of mast cell Toll-like receptors 2 and 4 in allergy and innate immunity. J. Clin. Invest. 109:1351. Sato, S., F. Nomura, T. Kawai, O. Takeuchi, P. F. Muhlradt, K. Takeda, S. Akira. 2000. Synergy and cross-tolerance between Toll-like receptor (TLR) 2- and TLR4-mediated signaling pathways. J. Immunol. 165:7096. Jones, B. W., K. A. Heldwein, T. K. Means, J. J. Saukkonen, M. J. Fenton. 2001. Differential roles of Toll-like receptors in the elicitation of proinflammatory responses by macrophages. Ann. Rheum. Dis. 60:(Suppl3):iii6. Carl, V. S., K. Brown-Steinke, M. J. Nicklin, M. F. Smith, Jr. 2002. Toll-like receptor 2 and 4 (TLR2 and TLR4) agonists differentially regulate secretory interleukin-1 receptor antagonist gene expression in macrophages. J. Biol. Chem. 277:17448. Dziarski, R., Y. P. Jin, D. Gupta. 1996. Differential activation of extracellular signal-regulated kinase (ERK) 1, ERK2, p38, and c-Jun NH2-terminal kinase mitogen-activated protein kinases by bacterial peptidoglycan. J. Infect. Dis. 174:777. Rabehi, L., T. Irinopoulou, B. Cholley, N. Haeffner-Cavaillon, M. P. Carreno. 2001. Gram-positive and Gram-negative bacteria do not trigger monocytic cytokine production through similar intracellular pathways. Infect. Immun. 69:4590. Xu, L., M. H. Khandaker, J. Barlic, L. Ran, M. L. Borja, J. Madrenas, R. Rahimpour, K. Chen, G. Mitchell, C. M. Tan, et al 2000. Identification of a novel mechanism for endotoxin-mediated down-modulation of CC chemokine receptor expression. Eur. J. Immunol. 30:227. Xu, L., R. Rahimpour, L. Ran, C. Kong, A. Biragyn, J. Andrews, M. Devries, J. M. Wang, D. J. Kelvin. 1997. Regulation of CCR2 chemokine receptor mRNA stability. J. Leukocyte Biol. 62:653. Sica, A., A. Saccani, A. Borsatti, C. A. Power, T. N. Wells, W. Luini, N. Polentarutti, S. Sozzani, A. Mantovani. 1997. Bacterial lipopolysaccharide rapidly inhibits expression of C-C chemokine receptors in human monocytes. J. Exp. Med. 185:969. Sabroe, I., M. J. Peck, B. J. Van Keulen, A. Jorritsma, G. Simmons, P. R. Clapham, T. J. Williams, J. E. Pease. 2000. A small molecule antagonist of chemokine receptors CCR1 and CCR3: potent inhibition of eosinophil function and CCR3-mediated HIV-1 entry. J. Biol. Chem. 275:25985. Sabroe, I., E. C. Jones, L. R. Usher, M. K. B. Whyte, S. K. Dower. 2002. Toll-like receptor (TLR)2 and TLR4 in human peripheral blood granulocytes: a critical role for monocytes in leukocyte lipopolysaccharide responses. J. Immunol. 168:4701. Fleit, H. B., C. D. Kobasiuk. 1991. The human monocyte-like cell line THP-1 expresses FcγRI and FcγRII. J. Leukocyte Biol. 49:556. Parker, L. C., G. N. Luheshi, N. J. Rothwell, E. Pinteaux. 2002. IL-1β signalling in glial cells in wildtype and IL-1RI deficient mice. Br. J. Pharmacol. 136:312. Ghosh, S., M. Karin. 2002. Missing pieces in the NF-κB puzzle. Cell 109:(Suppl):S81. Zhang, F. X., C. J. Kirschning, R. Mancinelli, X. P. Xu, Y. Jin, E. Faure, A. Mantovani, M. Rothe, M. Muzio, M. Arditi. 1999. Bacterial lipopolysaccharide activates nuclear factor-κB through interleukin-1 signaling mediators in cultured human dermal endothelial cells and mononuclear phagocytes. J. Biol. Chem. 274:7611. Sallusto, F., P. Schaerli, P. Loetscher, C. Schaniel, D. Lenig, C. R. Mackay, S. Qin, A. Lanzavecchia. 1998. Rapid and coordinated switch in chemokine receptor expression during dendritic cell maturation. Eur. J. Immunol. 28:2760. Sabroe, I., L. R. Prince, E. C. Jones, M. J. Horsburgh, S. J. Foster, S. N. Vogel, S. K. Dower, M. K. B. Whyte. 2003. Selective roles for Toll-like receptor (TLR)2 and TLR4 in the regulation of neutrophil activation and life span. J. Immunol. 170:5268. Dower, S. K., S. M. Call, S. Gillis, D. L. Urdal. 1986. Similarity between the interleukin 1 receptors on a murine T-lymphoma cell line and on a murine fibroblast cell line. Proc. Natl. Acad. Sci. USA 83:1060. Martin, M., J. Katz, S. N. Vogel, S. M. Michalek. 2001. Differential induction of endotoxin tolerance by lipopolysaccharides derived from Porphyromonas gingivalis and Escherichia coli. J. Immunol. 167:5278. Medvedev, A. E., A. Lentschat, L. M. Wahl, D. T. Golenbock, S. N. Vogel. 2002. Dysregulation of LPS-induced Toll-like receptor 4-MyD88 complex formation and IL-1 receptor-associated kinase 1 activation in endotoxin-tolerant cells. J. Immunol. 169:5209. Bennett, B. L., D. T. Sasaki, B. W. Murray, E. C. O’Leary, S. T. Sakata, W. Xu, J. C. Leisten, A. Motiwala, S. Pierce, Y. Satoh, et al 2001. SP600125, an anthrapyrazolone inhibitor of Jun N-terminal kinase. Proc. Natl. Acad. Sci. USA 98:13681.